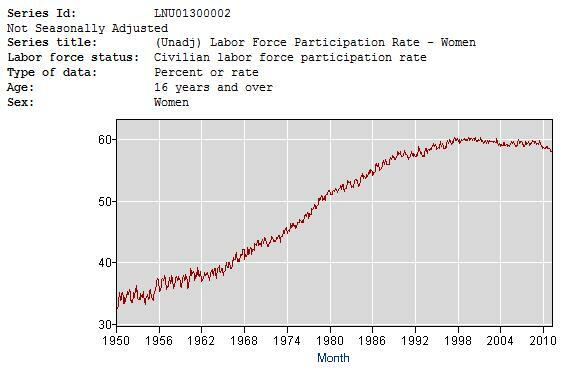 The explanation that immediately came to mind is the increase in female labor participation rate since the 1970s. It didn’t take me long to confirm this at http://www.bls.gov. 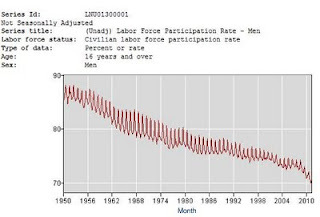 Male participation has steadily declined over the past 60 years, whereas female participation only started to decline as female Baby Boomers started retiring a few years ago. 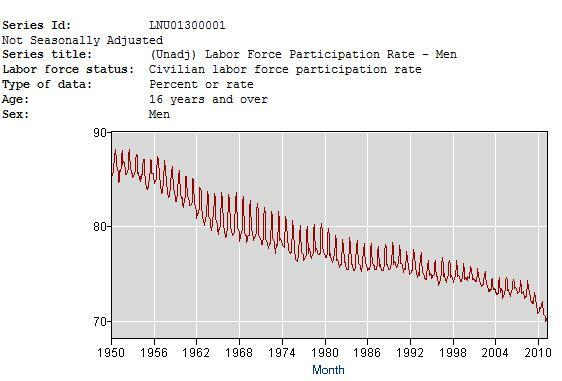 The seasonally unadjusted numbers also give a clue: males far more often engage in seasonal labor, which tends to be trades. This means that, in general, men are more inclined to work in trades and other such work that does not require a college education. Great Moderation notwithstanding, these jobs are less sensitive to the “perpetual” increase in GDP we’ve been experiencing since the advent of fiat money. That is, women – if they choose to work – tend to choose service industries, business, health care, etc. If they aren’t well-educated and the best they can hope for is Wal-Mart, they will be far more sensitive to what Mises called “the disutility of labor” than men will be. This is a legacy of traditional gender roles, I guess, but not necessarily in a bad way.